The down-looking SAIL demonstrator is shown in the figure. The target is set in a building away from the demonstrator at the 4th floor of the laboratory. One target is an aluminum model of air plane, and the obtained image is given. 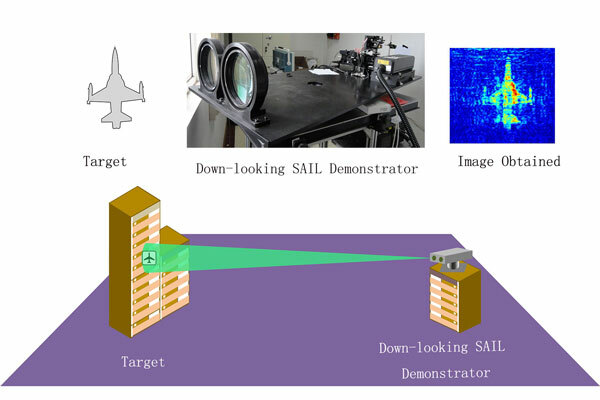 A synthetic aperture imaging ladar (SAIL) can provide two-dimensional active imaging of centimeter-class resolution at a long range, thus this field of research attracts much attention recently. SAILs usually work in a side-looking mode, so there are inherent defects like small optical footprint, limited receiving aperture and requirement for a matched optical delay. Moreover, the imaging will be easily affected by the phase interferences from atmospheric turbulence and mechanical trembling in the surrounding. A down-looking synthetic aperture imaging ladar proposed by professor Jianfeng Sun's research group, from Shanghai Institute of Optics and Fine Mechanics, Chinese Academy of Sciences, has overcome the difficulties. This study aims to conduct the outdoor verification experiments. It is reported in Chinese Optics Letters Volume 12, No.11, 2014. The side-looking SAIL is based on the 2D imaging with sight-distance resolving in the range direction and aperture synthesizing in the azimuth direction, and it adopts the configuration of transmitting by diffraction-limited beam and receiving by heterodyne detection with a local beam. However, the down-looking SAIL is based on the 2D imaging with lateral distance resolving on the target plane in the orthogonal direction of travel and aperture synthesizing in the travel direction, and its configuration is of projected imaging transmitting by two polarization-crossed co-axis beams and receiving by polarization-interfered self-heterodyne detection. The down-looking SAIL demonstrator represents a completely new kind of ladar, which has promising application in spaceborne and airborne observation or inverse-SAIL radar. For the first time, the effect of phase interference caused by atmospheric turbulence under different atmospheric conditions is eliminated in outdoor experiments at a distance of over 1.2 km. "It is a completely new concept and system to propose the down-looking SAIL, and the performance is essentially enhanced in comparison with side-looking SAIL." said Prof. Liren Liu from this group. The following works will be focused on the development of this principle, the further increase in optical footprint size and systematic receiving sensitivity, and the improvement of the demonstrator for airborne use.